12 Months Subscription for B1-Router. B1-Router is a WiFi router with an integrated VPN Client, enables users to connect multiple devices to a single VPN connection and increasing security and privacy of the user. B1-Router enables users to browse Internet anonymously and privately, while enhancing the security against hacking, surveillance, industrial espionage and cyber attacks. 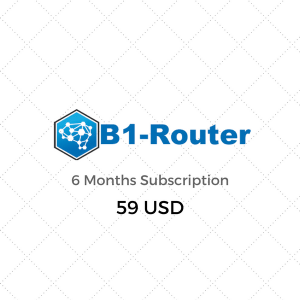 B1-Router enhances the security and privacy of all the devices connected to it. © 2016 B1-Router | Kryptotel Secure Communications | All Rights Reserved.